Common Core State Standards for Speaking and Listening are divided into six anchor standards. There is no technical version for this section. 1. Prepare for and participate effectively in a range of conversations and collaborations with diverse partners, building on others' ideas and expressing their own clearly and persuasively. SEE EXAMPLE. 2. Integrate and evaluate information presented in diverse media and formats, including visually, quantitatively, and orally. SEE EXAMPLE. 3. Evaluate a speaker's point of view, reasoning, and use of evidence and rhetoric. SEE EXAMPLE. 4. Present information, findings, and supporting evidence such that listeners can follow the line of reasoning and the organization, development, and style are appropriate to task, purpose, and audience. SEE EXAMPLE. 5. Make strategic use of digital media and visual displays of data to express information and enhance understanding of presentations. SEE EXAMPLE. 6. Adapt speech to a variety of contexts and communicative tasks, demonstrating command of formal English when indicated or appropriate. SEE EXAMPLE. Speaking/Listening Anchor Standard 1. Prepare for and participate effectively in a range of conversations and collaborations with diverse partners, building on others' ideas and expressing their own clearly and persuasively. The Ag Issues Library presents both sides of current agriculture issues and includes instant online surveys. These lesson topics present ample opportunities to explore ideas and interact in group discussions. More than 75 lessons include exercises where the class is divided into small working groups to complete a task. More than 60 lessons include suggestions for class discussions. Many additional lesson exercises could be completed as group activities. Speaking/Listening Anchor Standard 2. Integrate and evaluate information presented in diverse media and formats, including visually, quantitatively, and orally. This lesson explores how we receive and send information through images such as photographs, maps, logos, charts, webpage design and video clips. The PowerPoint summarizes lesson points and includes a number of photographs. Students work alone and in groups to complete exercises using the principles presented in the lesson material. Speaking/Listening Anchor Standard 3. Evaluate a speaker's point of view, reasoning, and use of evidence and rhetoric. NR035 What Is an Endangered Species? This lesson describes how a wildlife species become "endangered," and what is being done to save endangered species from extinction. The PowerPoint reviews main points from the lesson with illustrations. In the exercises, students review lesson points to identify controversial provisions of the Endangered Species Act, and look for examples of that controversy. A class debate delves into the details of one example. Speaking/Listening Anchor Standard 4. Present information, findings, and supporting evidence such that listeners can follow the line of reasoning and the organization, development, and style are appropriate to task, purpose, and audience. This lesson from the Ag Careers library discusses a very important speaking and listening skill -- applying for a job. The PowerPoint reinforces main lesson points. Students conduct mock interviews for exercise 1, evaluate appropriate clothing in exercise 2, and take part in a group discussion of interview fears and concerns in exercise 3. Speaking/Listening Anchor Standard 5. Make strategic use of digital media and visual displays of data to express information and enhance understanding of presentations. The topic of this lesson is how water is used, and why it is so important to human life. 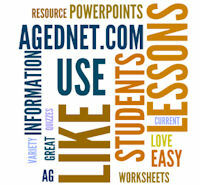 The PowerPoint reviews key lesson points with additional graphics. Exercise 3 for this lesson has students work in small groups to prepare a public service presentation about reducing the risk of water contamination in their area. The accompanying worksheet asks students to list main ideas, identify their audience, assign tasks, identify sources and provide copyright details. Speaking/Listening Anchor Standard 6. Adapt speech to a variety of contexts and communicative tasks, demonstrating command of formal English when indicated or appropriate. This lesson explains how students can learn to meet and help plant and floral customers. The PowerPoint recaps main lesson points and includes a checklist for evaluating communication. Exercises for this lesson include role-playing where students take turns being the customer or the salesperson. The role-playing is followed by a class discussion.